The Lindy rig is a simple way to deliver live bait to walleye in lakes and rivers. Few walleye fishing rigs are as simple and effective as the Lindy rig. This rig is designed to keep live bait near the bottom, where walleye typically feed, while resisting snags and allowing the bait to move naturally. Invented by Al and Ron Lindner in 1968, the Lindy rig is available in bait shops all over the country, but you can tie your own with a few basic supplies. The basic supplies required to make a Lindy rig are widely available at most bait and tackle shops. You will need a spool of fishing line, a bait hook, barrel swivel and sinker. 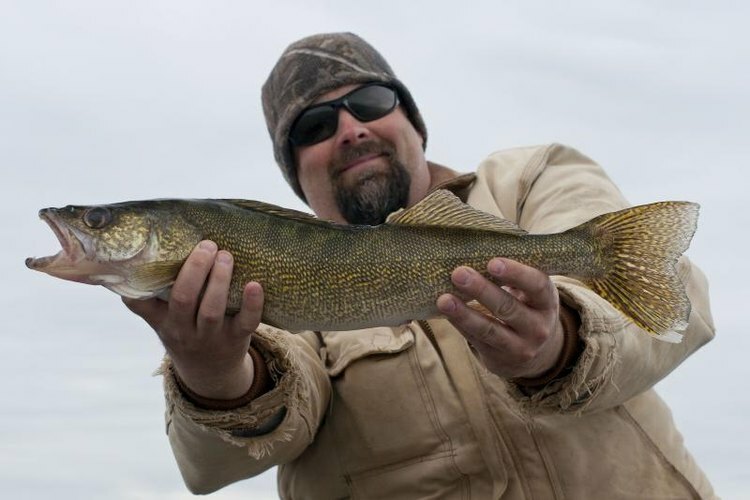 Clear monofilament line between 8- and 10-pound-test is ideal, and size 2 to 4 hooks are right for most walleye baits. You can also make a Lindy rig with two hooks. The sinker is a key component of the Lindy rig, and the most common type is a walking sinker, also known as a Lindy sinker or a boot sinker; this has a unique shape that allows it to walk across rocky bottoms without snagging. Spool the reel on your fishing rod with line and slip the sinker onto the end of the line. Tie one end of the barrel swivel to the line. The swivel keeps the sinker on the line while allowing it to slide up and down freely. To the other end of the swivel, tie a separate length of fishing line. This second line is called the snell, and it can be anywhere between 12 and 36 inches in length, although the longer end of this range is more common. Tie your hook to the opposite end of the snell using a snell knot, explained in many fish knot sources, including one shared below.. The Lindy rig has developed a lot of variations over the years, and you can adjust the rig depending on fishing conditions and personal preference. One of the most common additions is a second hook, sometimes called a stinger hook, which helps hook fish that bite short of the main hook. You can attach a stinger hook by leaving a few extra inches of line below the first hook when you tie the snell. Lindy rigs can also include beads or spinner blades above the hook to provide extra attraction for fish, or a float to make the bait more buoyant. Lindy rigs are effective for live bait fishing with night crawlers, minnows and leeches. Night crawlers are typically threaded onto the hook at the head. If you use a stinger hook, you can insert it farther down the worm's body. Minnows swim most naturally when hooked through the lip or head, though tail-hooking is also an option. Leeches can be hooked at either end. Lindy rigs are meant to be fished fairly slowly near the bottom in rivers and lakes, but a faster retrieve can be more effective if walleye are feeding actively. If you are fishing from a boat, Lindy rigs are also useful for trolling.